Well, it’s about that time to start wrapping up the show coverage. I was planning on posting the third and final round of coverage this weekend, but ended up working, as well as temporarily acquiring a vinyl cutter. The latter occurrence took up the majority of my Monday so I wasn’t able to work on getting the post up. Oh well, I have some time tonight and will do just that. We pick up mid-afternoon when the show was really getting busy. The turnout was really, really good for it being the first East coast show that Weksos has put on. I was very happy for everyone involved at the success of the day. I don’t really have much else to say in this post that hasn’t already been stated. In this post we’ll take a closer look at some of the nice Hondas at the show, as well as a look at the roll-out. 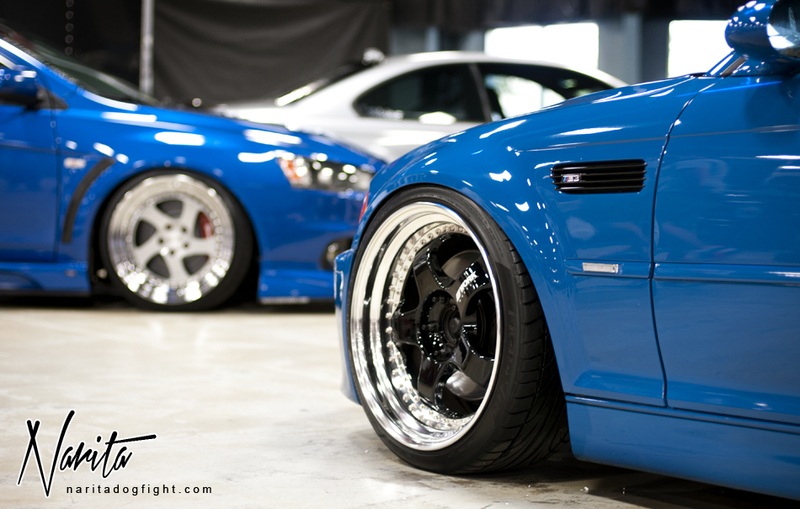 Again, you’ll be able to see the insane amount of variety that these Wekfest shows provide. Just click past the break and enjoy the rest of the shots. 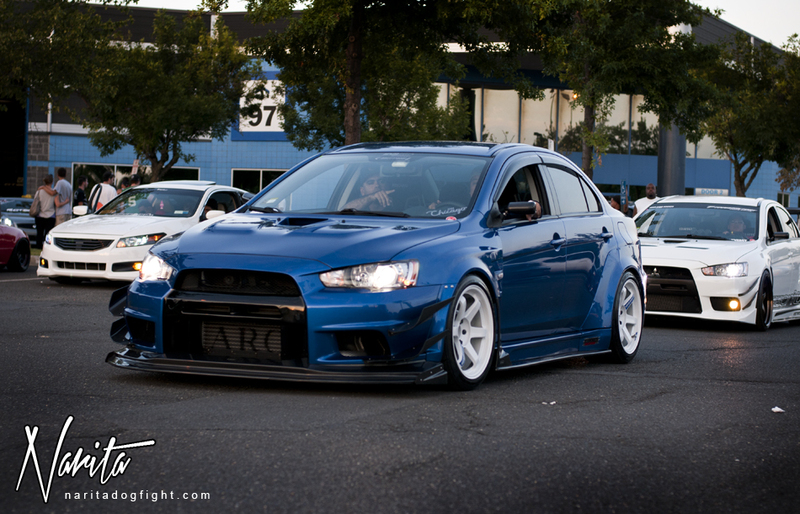 Another awesome looking EVO that was at the show – loved the different (fifty?) shades of grey used throughout the car. Can’t go wrong with a set of TC105’s either. 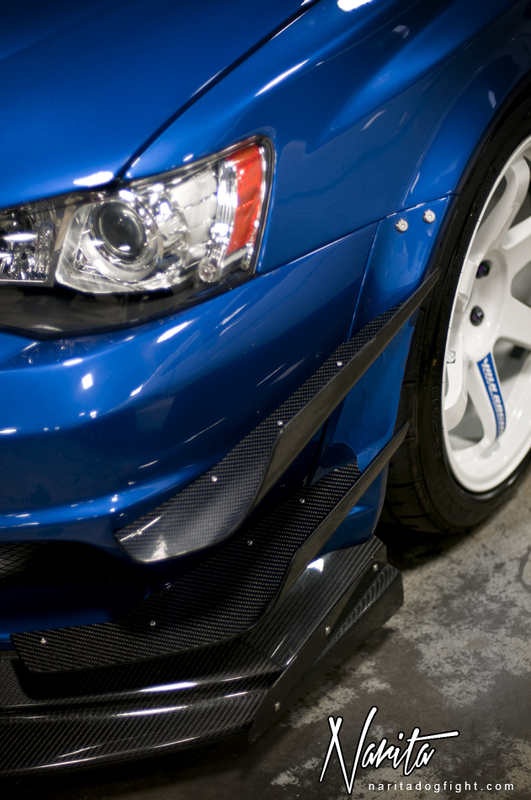 Avid EVO fans might also note that the wing is still the OEM one. Very cool. There were a couple really nice Honda’s at the show too. 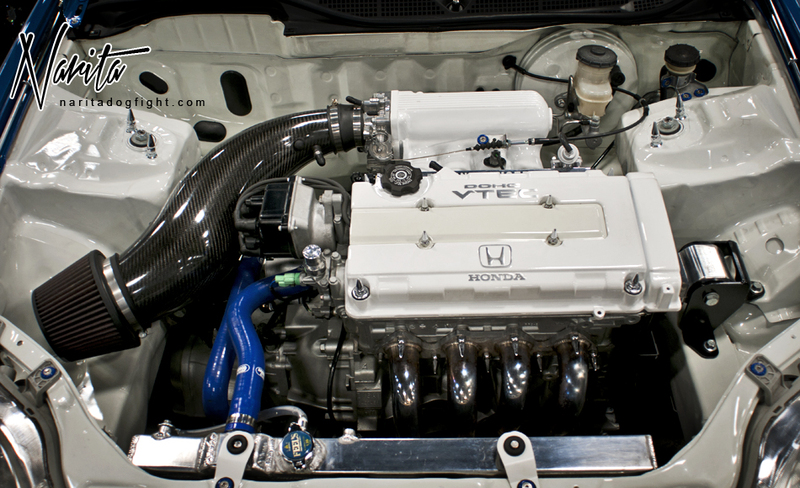 I would hate to have to clean this engine bay – it’s extremely…white. Really liked this Integra with a turbocharged K-series. 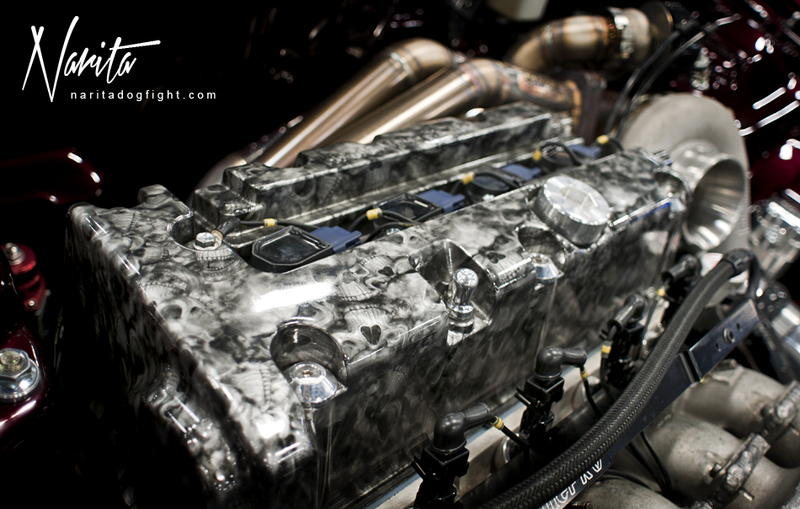 Some nice work on the valve cover. It’s clear that K swaps are extremely popular, but a nicely tuned B-series still sticks out more to me. I enjoyed the simplicity of this coupe. 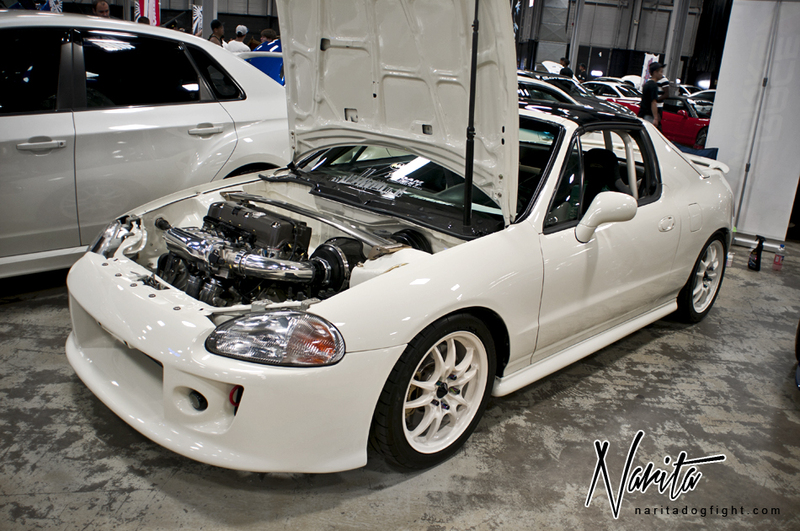 K-swapped Del Sol – something you don’t see too often. I don’t even see stock Del Sols that often anymore. Fancy pants wheel shot. This BMW and EVO were almost the same color. BRZ at the Rav Spec booth. 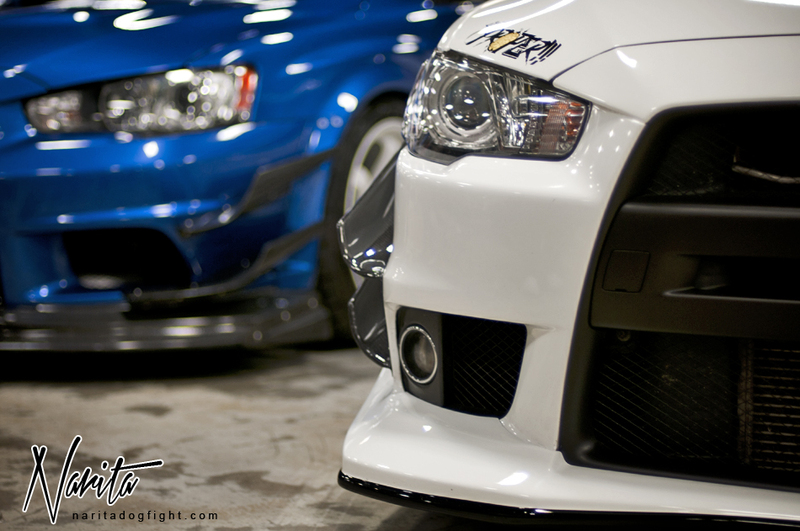 These two EVO X’s got to sit next to each other all day. I got a chance to compare them side by side – both good, but in their own ways. You can catch full shots of them in the other posts, and perhaps later in this one. 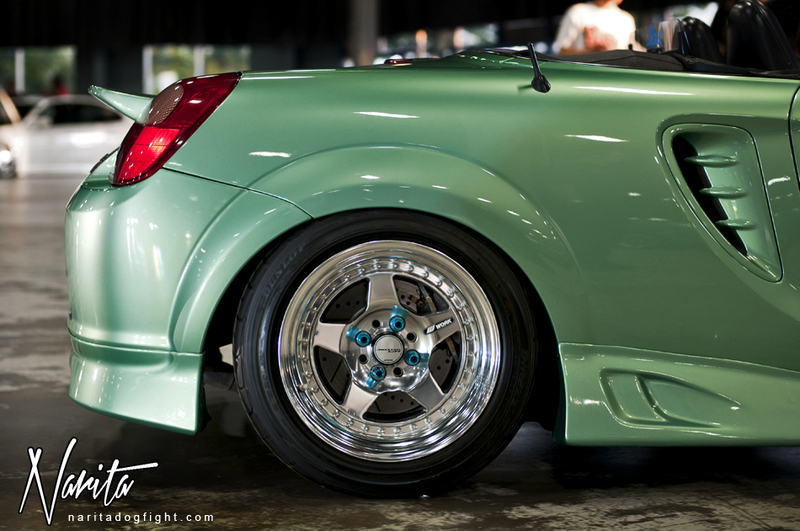 Glossy Inifiniti on some candy teal forged ISS wheels – thanks Freddy! Remember that tough looking 240 in the other posts? 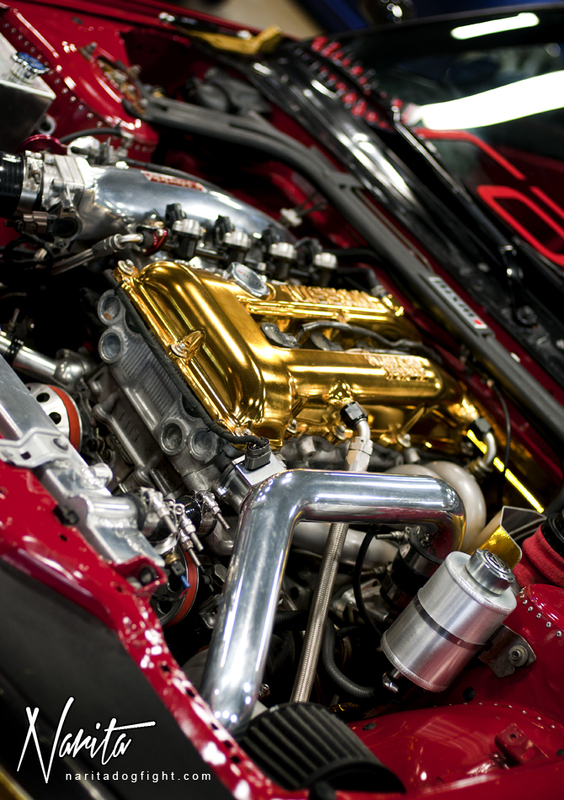 Well, this is it’s engine bay. I should have posted it sooner, but didn’t come across it until now. 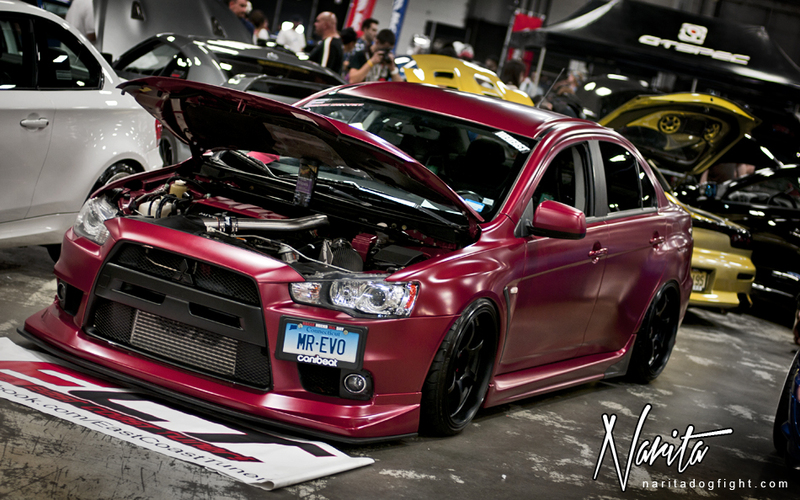 Another EVO X that was wrapped in this matte maroon color. It reflected the light inside the convention center in some very strange ways – made for a cool effect. 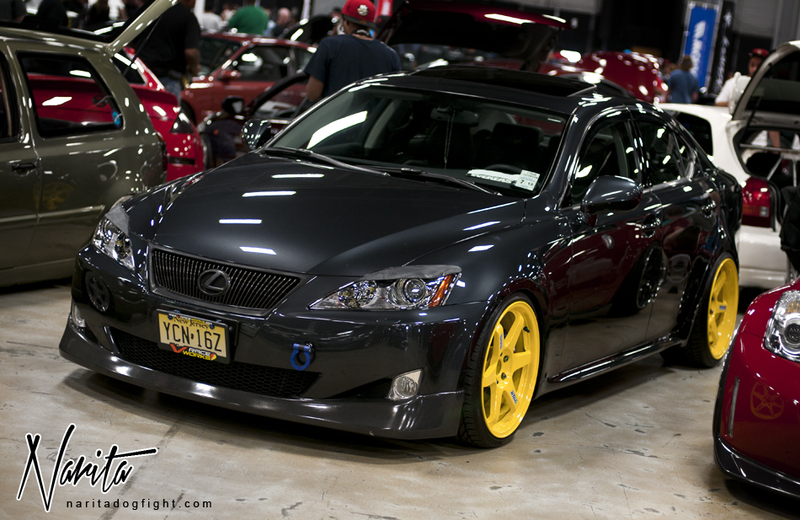 Lexus IS on some yellow TE-37s – I thought this was pretty unique. 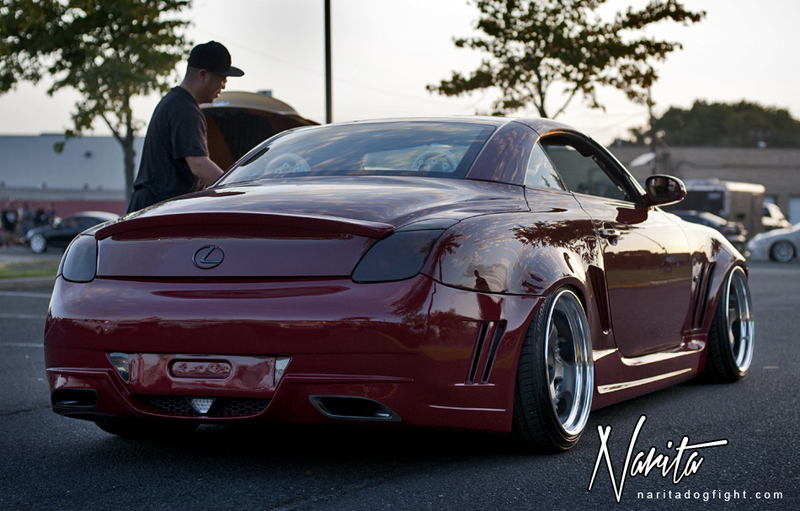 Another shot of Sergey’s beast of a MR2. Itasha styled Supra. This thing caught the attention of many of the by-passers. 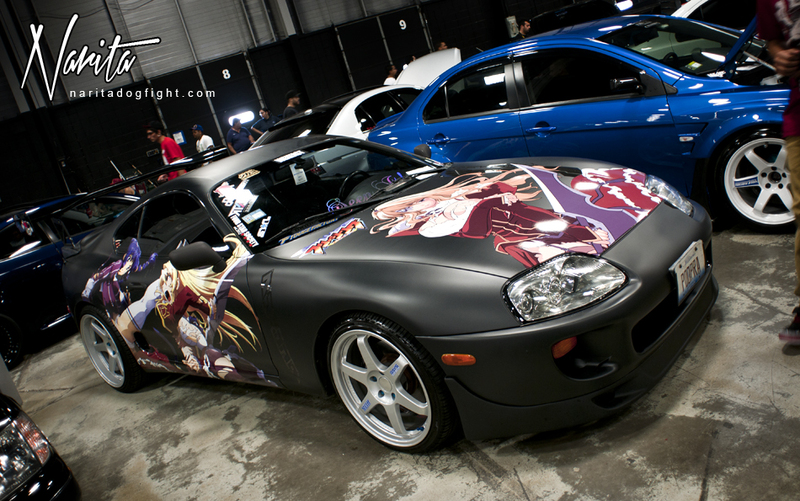 I wonder if many people know about Itasha style in America? 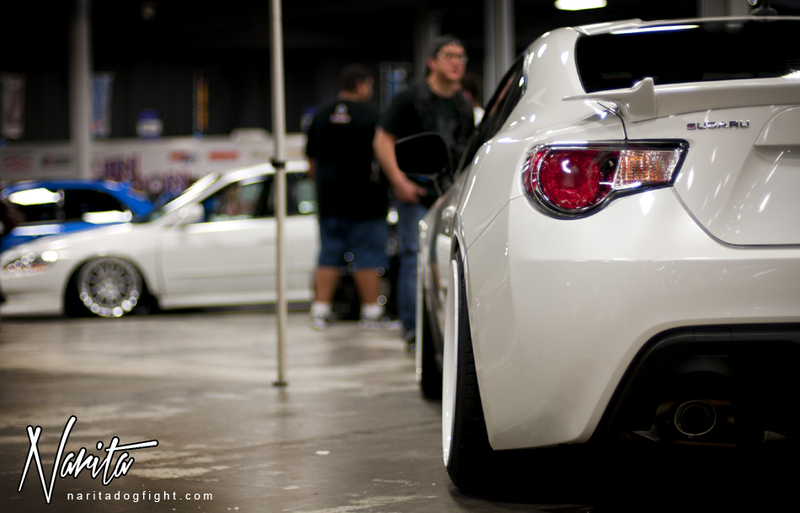 A few more shots of the Mugen themed hatchback. I had the opportunity to chat with the owner for a few minutes – good people. 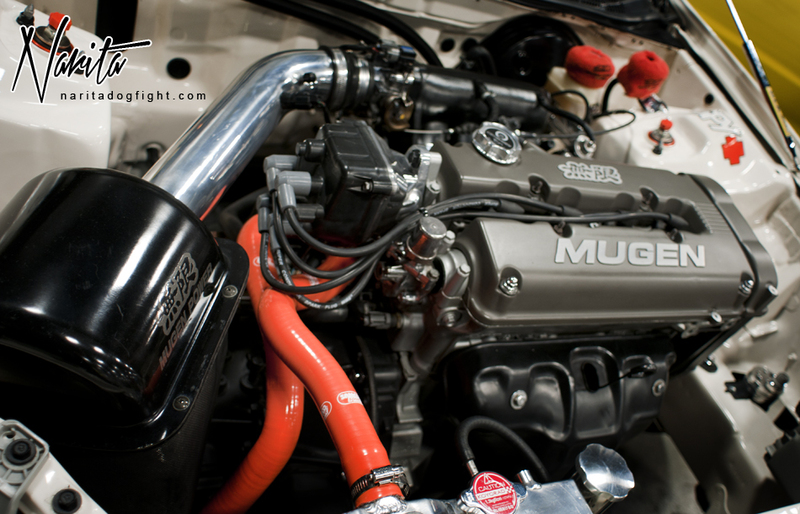 Says he has a few more plans for it including re-doing the work on the bay, and some more choice Mugen parts. Best of luck on the rebuild. There were a pair of well thought out EVO 9’s in the corner of the giant hall. This SC300 looked pretty cool on the anodized looking blue wheels. I’ve always liked blue on black. Couple different perspectives here. 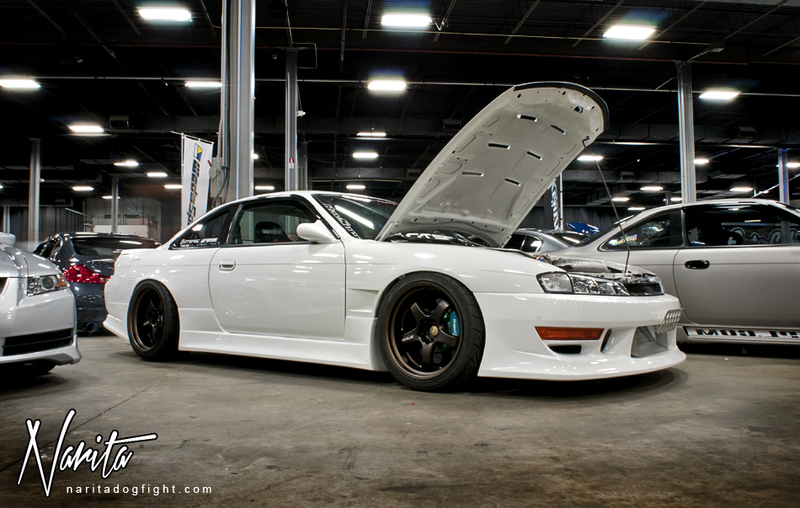 This turbocharged CL9 was awesome. I’m not sure if it won an award or not though, although the potential is there. The size of the LS430 definitely commands a presence. Especially with a true name of Celsior. Choice Vertex pieces and yellow Recaros made this IS stand out to me. I really enjoyed it. MR-S on a new set of polished Work Meister CR01’s. Evening time rolled around and it was time for everyone to leave. Personally, I was exhausted; I knew I would be, so I made sure to get a hotel that was close to the convention center. I stuck around for the roll-out and until the sun went down and called a taxi. After taking photographs indoors all day, it was nice to get outside in the setting sun. I enjoy photographing at this time of day. It was a little hectic though because the fire marshals and center employees were rushing everyone out of the building. Another SC430 that I didn’t really catch at the show. Those two EVO’s I posted close-ups of earlier. I would really like to see the blue one with a GT wing on it. 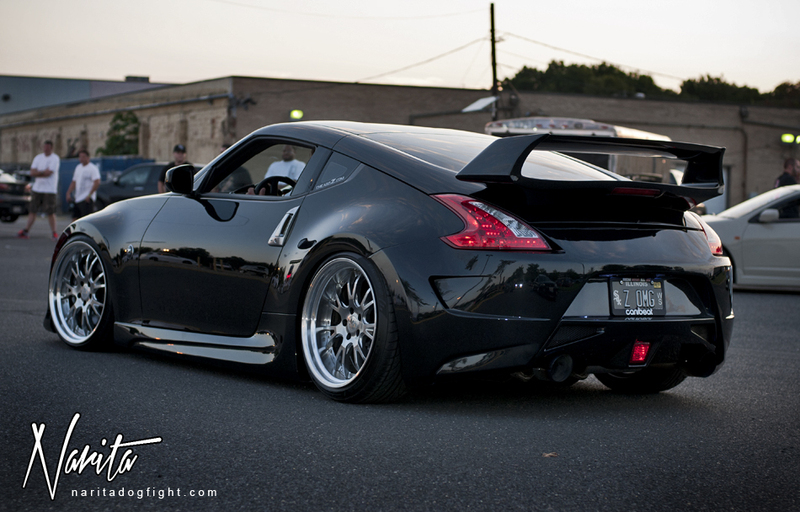 Of course, one more shot of this gorgeous Amuse Z34. This thing is so photogenic. Before I knew it the sun had set and it was time to go sleep. I said my goodbyes to the Weksos crew and felt pretty satisfied about my trip to the East. I got to meet a whole bunch of new people, and solidify my relationship with others. The next morning I also got a chance to go into New York for a little while too. I’ll leave off with this shot of a Panda girl because for some reason I think it’s fitting. Thanks again to everyone at Weksos for making these shows happen, and a tip of my hat to the East coast for providing quality builds that keep our passion going. Hope you enjoyed the coverage, and who knows, maybe I’ll see you in Texas. Thanks for visiting! Reblogged this on Bruton Auto. Those are ISS Forged wheels on that G37 Sean!